I’m out sitting at my local driving range when I hear one of the coaches explain to his student about how important golf balls can help with daily practice and out on the green. This was very interesting to me as I am used to just practicing with endless practice balls, however, I did not consider how much of a difference different brands of golf balls can make. So, I decided to speak to some coaches around my area and good quality players to see what some of the top performing golf balls are on the market right now. I’m a mid-handicapper myself so they tend to usually feel and look great as they head towards the woods but hopefully, me nerding out on some of the new technologies will help improve your game and bring your scores down. I know as a beginner, I used to opt for balls which are the best value, a brand name I recognize or a color that I like. To be clear, I don’t think there is anything wrong with that if you only want to play occasionally and have little interest in developing your game. What’s The Right Type Of Golf Ball For Me? Why Are There Dimples On The Golf Ball? As a beginner, I would feel as like getting a better quality golf ball would come at the expense of paying more money they pay and in most respects this is true. Golf balls are like anything else in life, generally the more you pay the better quality you are receiving in return. The problem with simply buying the most expensive set of golf balls you can afford is that they may not be suited to your game. Golf balls are constructed differently. For example, at the driving range, our golf pro mentioned that you are likely to find one-piece golf balls as these are the cheapest to produce. It is durable but does not give you a lot of distance and should never be used during a round of golf…unless like me, you love a cheeky round of crazy golf. Two-piece golf balls are firmer and help to produce more distance on shots than other balls. If you are just starting out and struggling to hit the ball very far, I’d say that a two-piece golf ball could be a good way to begin because their solid core will be more durable and give you more distance. However, once I really started to develop my game, I wanted more control on my shots and two-piece balls are not the best in that department. I didn’t actually realise this until I spoke to our golf pro during one of my lessons so I looked at trying out some three-piece balls. A three-piece golf is softer and offers more spin than a one-piece and two-piece golf ball. This ball is great for those who are happy with the distance they are hitting the ball and it gave me control over the style of shot I was playing. Around the greens, I could impart more spin on the ball and control what I wanted the ball to do. Now, if you are really looking at some of the top-end golf balls, you then start getting into four and five piece construction. I found that these give you the distance of the two-layer balls while bringing in the control and feel of the three-piece balls. How does the spin affect my game? So, if you struggle to get distance on the ball or find you are slicing it a lot, I’d recommend you checking the ball you are using. Opt to play with a two-piece ball as these tend to decrease the amount of side spin (slice) on shots and they will roll further along the fairway upon landing to help increase distance. If you are at the point in your development where you want a bit help with distance and some spin, you should use a mid-spin golf ball. These try to accommodate the best of both worlds and will not offer as much roll as low spin balls but will provide slightly more in the way of feel and control around the greens. If you really want to play some creative shots around the green, I’d say the high spinning ball is the best option. These provide the ultimate in feel and control for very technical short game shots. I’m sure as a golfer, you’ve probably noticed the dimples on the balls and have probably at some point wondered what they are. The best way I would be able to put it is to say that imagine if a golf ball didn’t have any dimples at all, these would travel less than half of what they are able to achieve with balls that have dimples. So, they have a huge effect on your distance and I won’t get too nerdy on this but simply they are designed to reduce the drag as they fly through the air. I have ready from a few companies that they can also help keep the ball going straighter, which is not a benefit I experience too often but I’m not sure I can bring that all down to just the dimples. Now, one term you may not have heard too often is compression which is usually a technical term used for the way you squash the ball to get it up in the air. However from my research, I was surprised to see that different balls have different compression properties. Again, I won’t go into too much detail but remember, lower compression balls are softer and compress more to offer more distance whereas higher compression balls are for players with fast swing speeds, who want more control. Ok, so hopefully, I’ve given you a brief introduction into some different properties of golf balls and things to take into account when buying them. Believe me, I’ve gone through enough balls to know how much of a difference they make when you move up from the typical driving range balls. But now, lets dive into the main body of the article which is our favorite golf balls on the market right now. It was a lot of fun testing these and hopefully this will help with your game. Let’s dive straight in! Golf allows you to choose the equipment you would like to use and the selection of clubs in a bag will differ to that of another bag. The same applies to golf balls and although every player must have golf balls in their bag, there are many different options. 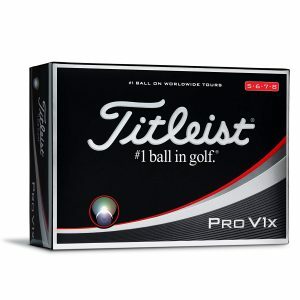 At the top end of the scale, in terms of performance and price we have the Titleist Pro V1. These golf balls are made by one of the top brands in the world of golf ball design, Titleist and are ideal for those looking to take their game to the very top. The reduced spin on the Titleist Pro V1 when hitting long shots means the ball will travel further but its approach play where the Titleist Pro V1 really comes into its own. The soft high performance Urethane Elastomer cover not only ensures the durability of the ball but also increases the amount control players have on shots. If you are someone who likes to be creative around the green, the softer feel of the latest Titleist Pro V1 will give you extra control on the ball required to play various shots. Not only that but the Drop and Stop short game technology allows players to target the pin and stop the ball on impact with the green. Perhaps not best for beginners, the Titleist Pro V1 is most suitable for experienced players who are searching for that little bit extra to take their game to the next level. Verdict: If you are an avid golfer like me, there must have been times when your other half has asked for what you want for your birthday or Christmas and you’ve asked for Titleist Pro V1 balls. Everyone knows that these are impressive and always reliable. Plus they sound and feel so beautiful when struck right, there is no between feeling! With the advancements in technology, golf ball designers are always looking to release something innovative and Callaway have done just that with their range of Callaway Truvis golf balls. The first thing you will notice when looking at these golf balls is the colour pattern. The Callaway Truvis balls feature a coloured pattern which makes the ball look remarkably like an old-fashion football. However, the pattern is there for a reason and Callaway say it helps players to focus and maintain visibility of the golf ball. If you have had trouble focusing on the ball or seeing the ball in-flight, the Callaway Truvis could be a good choice. The Dual SoftFast Core inside the Callaway Truvis golf balls enhances the speed of the ball off the tee while lowering the spin. This increases distance off the tee but the benefits do not stop there. The Callaway Truvis has a 4-piece construction which gives players more control on approach shots plus allows for more aggressive shots to towards the pin from 100 yards. The design means players can enjoy increased spin on approach shots and this encourages attacking approach play. The Callaway Truvis come in at the higher end of the price scale and if you are a beginner player who loses a couple of balls per round, they may not be for you. However, if you are comfortable with your golf and want to try a ball with more control, the Callaway Truvis come highly recommended. Verdict: Again, these are a pretty well-known set of golf balls if you are a keen golfer. 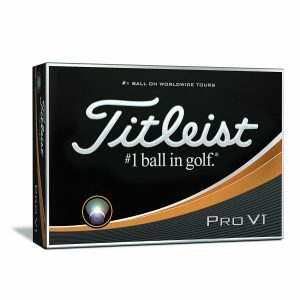 To be honest, they do not come cheap and are slightly more expensive then the reliable Pro V1’s. But, let me tell you this, none of the golf balls on here or the ones we have tested have come close to the amount of spin these provide and how awesome they look on address. You will not be disappointed! If you are a player looking to take your game to the next level, the Titleist Pro V1x could be the perfect golf ball for you. This is the golf ball used by many professional golfers and as such offers the performance to match. The Titleist Pro V1x is not only great for generating a high launch off the tee and long distance striking of the ball but is also superb for approach shots and creativity around the green. The softer feel of the Titleist Pro V1x offers players more control on short shots and the Drop and Shot short game control only adds to the level of precise play capable with these golf balls. In the right hands, the Titleist Pro V1x are superb. Verdict: Again, you’ve seen the Pro V1’s on the list already. The V1x’s are designed for distance with a higher launch whereas the Pro V1’s have a more penetrating trajectory. Obviously, not everyone will see this straight away, but I was able to get 20-30 more yards with my driver. Around the green, they are very sensitive and provide awesome feel! They also make a louder sound than the V1’s which I personally like. If you are looking to achieve maximum distance off the tee you may have just found the perfect ball in the Callaway Supersoft. 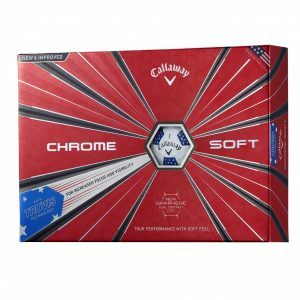 This is the lowest compression ball Callaway have ever produced and that means higher ball speeds and reduced spin off the tee, both of which aid in producing great distances. However, the Callaway Supersoft also feature the new Tri-onomer cover and this helps to create more spin on wedge shots and other styles of shot around the green. 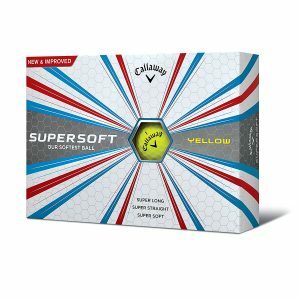 The Callaway Supersoft can be purchased in a range of colours to suit your personal style on the golf course and are a nice choice for those wanting to deliver full distance while maintaining control. Verdict: These Supersoft golf balls are all about value,value and more value! They are less expensive than the premium options above but still hold the great quality offered by the others. As expected, they feel so soft off the club and land softly rolling out a foot or two. I also spoke to a local coach down my club who advised that these are especially good if your swing speed is less than 80mph. For the price point, you will not be disappointed with these. TaylorMade have been making great strides in the golf ball market in recent years and the TaylorMade TP5X could be their best design yet. The five layer construction of the golf ball offers fantastic control around the green. 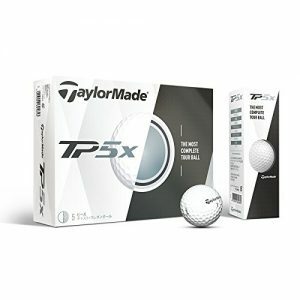 The Dual Spin cover combines with the five layer design of the ball to make the TaylorMade TP5X arguably one of the best golf balls on the market for short game play. However, the TaylorMade TP5X is also good off the tee and the Tri-Fast Core creates low spin and maximum energy transfer to produce long distances. The higher launch of the TaylorMade TP5X also allows for attacking golf on approach shots and for players to stop the ball easily on the green. Verdict: When we tested these, it was a bit of a strange one. We were actually testing the B330S but found an almost new TP5X in the rough. We hadn’t originally considered these but boy are we glad that we did! I was getting solid distance and flight with these and they were great around the greens too. They are a premium golf ball from Taylormade so if you have a tendency to lose a few then maybe buy end of season tour balls. 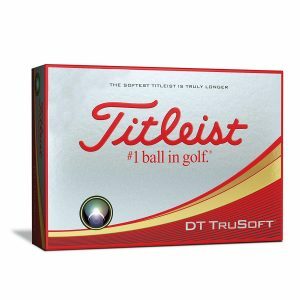 The main aim of the Titleist DT Trusoft is given away somewhat in the name of the golf ball. Titleist have designed the DT Trusoft to appeal to players who are looking to have more control of the golf ball around the green. The Titleist DT Trusoft delivers that by offering the softest compression of all the balls in the Titleist range. The TruFlex cover is one of the main features of the Titleist DT Trusoft and this provides a soft feel for every short shot played on the golf course. The levels of spin achievable on the ball makes for improved stopping power on the green but the TruTouch core still allows players to achieve good distance off the tee. Verdict: I remember my first shot with these down my course, I hit a short iron into the green which stopped with spin moving back a couple of feet right by the pin, so I personally love these balls. Unfortunately, they didn’t do this every single time but they feel you get with these is amazing. Really good ball for a mid-high handicapper with a decent swing speed. The Bridgestone Tour B330S are aimed at top level golfers who want to improve the quality and control of their short game. They come with a new TOURcore technology and this has been designed to optimize performance for players with swing speeds of over 105 mph. The seamless cover technology used by the Bridgestone Tour B330S ensures a consistent dimple coverage on the exterior of the golf ball. This helps to increase roll, produce greater distance and delivers a more consistent ball flight, so you can trust the results when using Bridgestone Tour B330S golf balls. A new SlipRes cover on the ball offers more spin control for shots around the green and a greater deal of control when playing shots from the rough. Verdict: These ones from Bridgestone go a little under the radar and we are not sure why. Obviously, they may not be as well-known as some of the other brands but these are some very high quality balls and deserve more credit than they get. If you have trouble getting the ball not to roll out then maybe it might be worthwhile investing in these. 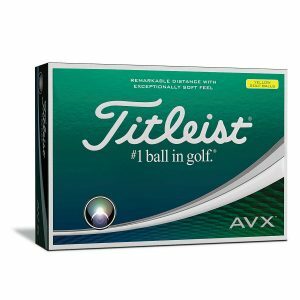 If you are looking for a premium performance golf ball to help bring out the best in your game, you could do a lot worse than the Titleist AVX. These golf balls have been designed to produce maximum distance and offer precise control on short shots and the Titleist AVX deliver on both fronts. The balls have been produced in three layers. The inner layer is a very soft core and the middle layer features a highly flexible casing which helps to generate more speed and control spin. The outer casing of the Titleist AVX is a cast urethane cover and this aids control around the green by giving a soft feel yet plenty of durability. Verdict: I would consider this quite a premium price golf ball so you are looking at top of the range with these. But, if your budget is up there, then this is worth having a think about. We love the control that you get on these as it is so easy to put a fade or a draw with these. The AVX’s also have such soft feel on approach and off the putter with some even saying that they can be better than the Pro V1’s. Pretty good deal we think! Srixon may still be a new name to some golfers but they have been in the market for several years and are making a name for themselves with their golf ball design. 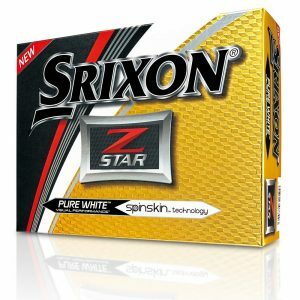 The Srixon Z-Star are a great option for those who want to try playing with a pro-quality ball but do not want to break the bank. The lower compression core of the Srixon Z-Star produces lower spin, higher launch and therefore more distance off the tee but also creates a softer feel for those delicate shots around the green. The simple pattern has been made more aerodynamic in comparison to previous editions and this delivers a more consistent ball flight. The Srixon Z-Star are high quality and recommended for players with swing speeds of 90 mph or more. Verdict: We love Srixon here as they produce some awesome golf equipment and it’s no different with their golf balls. I personally love the Z-Star over their other golf balls because the balls tend to stop noticeably quicker on the greens. I remember reading somewhere that even the outer coating helps the ball spin. In terms of feel, it’s perfect, not too hard or too soft and a lovely feeling of the putter too. Great for a mid-handicapper golfer. The Bridgestone E6 golf balls target players who are looking to hit the ball longer and straighter. While that’s the aim for all golfers who would like to improve, the Bridgestone E6 golf balls produce low driver and long iron spin as a means to maximise distance. The Delta Dimple design on the outer of the Bridgestone E6 golf balls work to encourage straighter shots, with optimised launch and superior stopping power to previous Bridgestone balls. 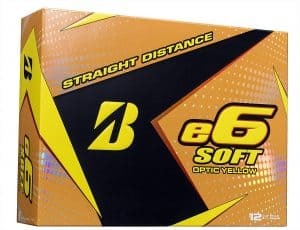 So, despite being great for distance and accuracy off the tee, the Bridgestone E6 are soft enough to offer plenty of control on approach to the green. Bridgestone E6 will attract players looking for more distance but do no want to lose sight of their short game. 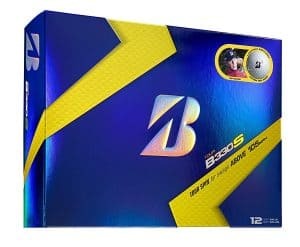 Verdict: We saw Bridgestone feature earlier and these are another set of golf balls that are great value for money without sacrificing too much quality. I have tested balls that don’t perform as well as this which have cost twice as much especially with the acquired distance and control around the greens. You won’t be disappointed with buying these!